This fun Halloween-themed craft idea is brought to you by Minted, but all thoughts are my own. You probably know Minted.com for their stunning and unique holiday cards, but did you know that they have a blog featuring all sorts of crafts and projects, too? Julep, the official blog of Minted (get it? mint julep? ), is full of fun projects and crafts, from crafts to do with kids to wedding favors to decor for your home. And although it may be time to start making plans for this year’s Christmas cards (I have absolutely no idea what we’re doing, by the way), I’d rather continue enjoying the Halloween pumpkins and witches and monsters for at least a few more days. 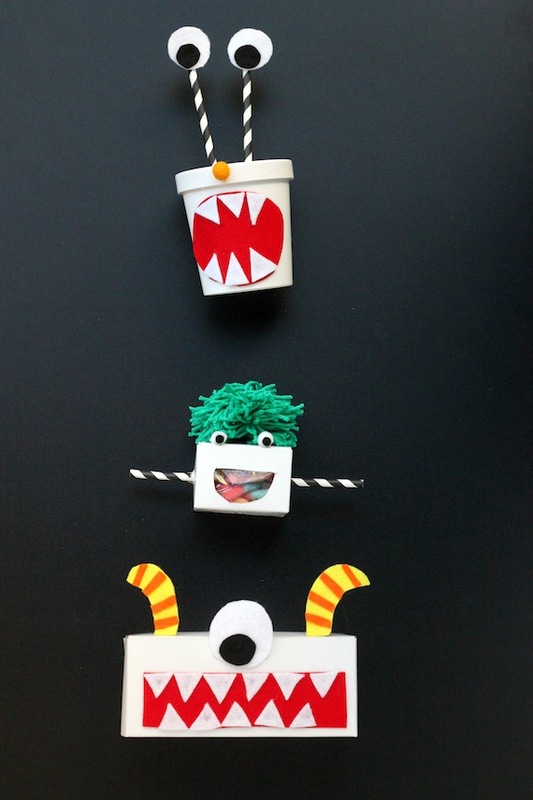 Take these Monster Favor Boxes as an example. Are they not adorable? I can picture my kids going absolutely crazy over putting the mouths and pointy-sharp teeth and pom-pom hair onto their boxes. Wouldn’t they be perfect for party favors, gifts for friends or teachers, or just cute Halloween decorations? I’m actually dying because I discovered that Minted also has party supplies – how cute is the Monsters Allowed party theme, complete with centerpieces, banners, garland and invitations. I also found an adorable paper strip pumpkin and the easy Halloween washi tape candles. Each of the projects has step-by-step instructions with gorgeous photos. 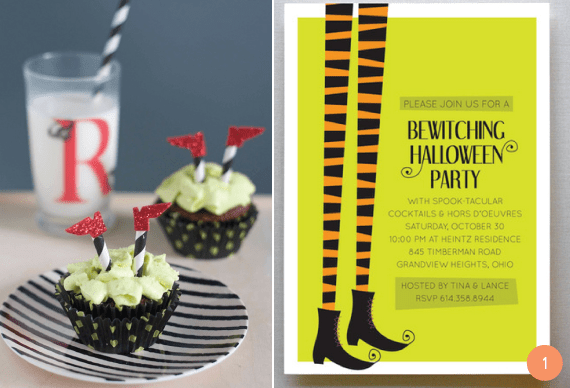 I love how they’ve paired the perfect crafty project with creative Halloween party invitations from Minted. It may be past time for sending out Halloween party invites, but it’s NEVER too late to make Wizard of Oz-themed Wicked Witch cupcakes. Am I right? PS – there are tons of other cute card-and-treat ideas on the Halloween party post as well as DIY projects and crafts for every season and celebration. It’s time to think about Holiday Cards! Have you thought about your holiday cards yet this year? What’s your holiday card style? Do you take a new family picture each year and order a colorful photo-based card to send to family and friends? Those are the cards I prefer to send out AND receive…but I often run out of inspiration (and time). I love that Minted.com has thousands of talented designers that do the design work for me and all I have to do is upload my picture, add my message and click order. If you place your order before Tuesday 10/29, there’s a great promo code on the site for 10% off your order. You can even start your order now, get the discount, and add your photo later. These are so cute and so creative we will have to do these next year thanks for sharing this one. There are really cute. Thank you for sharing this great idea! what cute ideas! being a life long wizard of oz fan, i just love the cupcakes! but i think my favorite is the candles. so easy and elegant – change up the colors (or not) and you have something nice for any time of the year. I love the cupcakes. I didn’t know that Minted had such neat stuff. I want to make some monster cupcakes after watching Monsters University with the kids this weekend. I had no idea they had party supplies and ideas. Those favor boxes are super cute!!! Ya know what?? I did NOT know that Julep WAS minted!!!! I love, love, love those cupcakes. Those are too cute and unusual too! They would be a hit at the Halloween Party I am attending Thursday night. Those monster favor boxes are just so adorable, love em! Thanks so much for the coupon code, I love saving! I am going to have to check out the selection at Minted, sounds awesome! I had no idea Minted offers stuff like those favor boxes. I wonder if they will have some for the Christmas holiday? It’s time to pay their site a visit. I had never heard of Minted!! Sure I’ll give a look when ordering my Christmas cards. Thanks for sharing. Those are just adorable! I really like how playful and modern Minted’s cards and everything they sell are! Awe, what a cute idea! This is a good idea for my son’s school. Those are just adorable. What a great Halloween treat! How cute!!! I actually just watched Monster’s University over the weekend and now i know what Monsters are so popular right now :-)! The boxes are so cute. Minted definitely has some quality items.